Call Senator Cory Gardner's Office to respectfully demand an in-person Town Hall on April 20th, 2017 in Ridgway, CO. 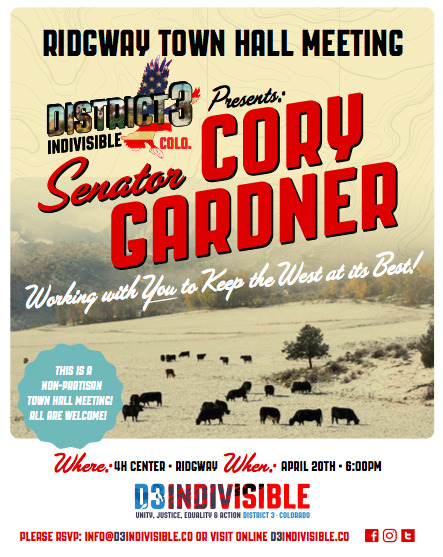 The Town Hall with (or without) Senator Cory Gardner is only a week away. Let Senator Gardner know that telephone-town halls are simply not enough. Call Senator Gardner to let him know that his attendance is expected on April 20, 2017 in Ridgway, CO. Tell him that concerned and active citizens will continue to hold in-person Town Halls across District 3 until he agrees to speak with his constituents in person. Help spread the word. Please forward. Please contact your local media outlets to let them know that you will be attending this event and that you expect Senator Gardner to be there.